The insensitive tweet, which wasn’t the only one of the day, has trigged a rightful cascade of contempt that could stain the company. At the same time, the fallout from the tweet shows how social media is changing the nature of crisis communications. The company has now removed the light-hearted “fabulous friday” tweet and its Twitter account appears to have fallen into a stunned silence after issuing a longer four-part apology. The incident has proved remarkable not only for the depth of the Celeb Boutique’s idiocy but for the virulent and mob-like response it has invoked. As of Friday afternoon, Twitter is alight with thousands of people calling the company vile names and demanding that it pay money to a victim’s fund. A similar drama is unfolding around a Twitter account associated with the National Rifle Association which published: “Good morning, shooters. Happy Friday! Weekend plans?” The NRA claims that the tweet, which has since been removed, was published by an individual who was not yet aware of the events in Colorado. Even though the NRA tweet appears to have been a case of bad timing more than anything else, it has still generated a wave of angry responses. In the bigger picture, today’s tweets demonstrate two things. The first is simply a reminder that the media and public are hyper-attuned to appearances of callousness at a time of tragedy. Recall the photos of President Bush flying over Hurricane Katrina. The issue was not that the President didn’t care — it was that he appeared not to care. The situation was much the same with today’s tweeters who were almost certainly ignorant or unlucky rather than callous and bad. The insults raining down on them represent an urge to vent over the senselessness of the Colorado shootings as much as they do anger at the NRA or Celeb Boutique. While public anger at a time of tragedy is not new, the speed at which it is expressed is new. Social media means not just that a company like Celeb Boutique can damage its brand more quickly and broadly than ever before, but that it has far less time to undo that damage. In the past, a company could detect a bad news story early on and work with professionals to spin the story. In the case of Celeb Boutique, its chance to fix the damage has already come and gone. Great post, by the way! And good comments too. Checkout the miserable twitter campaign organized by the Maldives Marketing and PR Corporation, MMPRC. The planned to trend #sunnysideoflife which is the tag line for marketing the Maldives Islands. What went wrong? Timing, when more than the half of the country thinks current sitting govenment is there by a coup d’Ã©tat. The, now opposition who are a lot more fluent in social media and Internet took it around and made so much bad publicity, that now less than 1% is on the positive association for PR. The officials who drove this campaign from the govt authority are reasonably vocal against a large crowd who are more fluent on social media, and ntimidated them just before the launch. The same officials didn’t listen to the advice to delay or stop the campaign. Checkout #sunnysideoflife what was an offices campaign that was targeted at trending it on the 12july and backfired. Whether if its on Twitter or Facebook, we sure have to be more careful when expressing our thoughts. There are times to make jokes and mourn. But the stupidity of these moron at Celebrity Boutique cant be tolerated. Can’t be tolerated? This was an innocent, if upsetting, mistake by a UK based company. No harm was intended, little if any real world harm was done. People are clearly quick to judge and express rage instead of thinking about real solutions. There is no place for forgiveness anymore. What example are we setting for our children here? This self-righteous belief that the world revolves around the US is annoying. The tweet was no mistake – as is clear by the ;) at the end of the statement. They knew EXACTLY what they were doing. 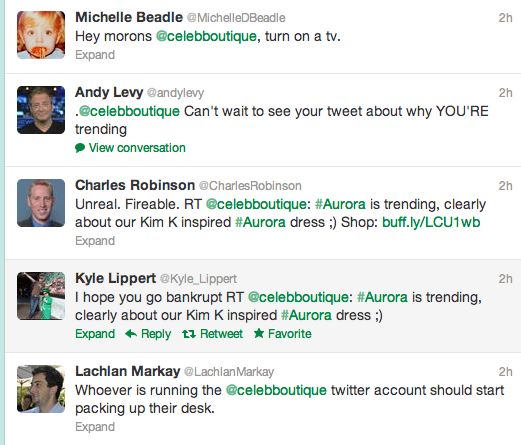 @Jim Dempsey I’m sure that they knew that #Aurora was not trending because of their Aurora dress (hence the “;)” ), but I strongly suspect they had no idea WHY it had become a trending topic. Maybe they thought it was about some fancy northern lights as a result of the recent-ish large CME. “Google is your friend” obviously applies, but I doubt anyone consciously decided to sell a dress on the back of a mass shooting. As I argued above â€“ brain fart. Sorry Bush didn’t care about NOLA it had nothing to do with appearances. “Heck of a job Brownie” ring any bells”? Same problem with Celeb Boutique. It is just a hell of a lot harder to hide from stupidity these days and the general public doesn’t have a whole lot of patience for stupid and callous these days. Unfortunately, we are all stupid and callous on occasion â€“ our foresight is really awful relative to our hindsight. The only alternative is to resort to endlessly repeating empty slogans and well-worn platitudes, which is exactly where are politics are going these days. We need to find a better balance than apoplectic self-righteous rage over every brain-fart. Thank God for people with common sense!